Store Home » Bed Bug Mattress Encasements » HOSPITOLOGY PRODUCTS Sleep Defense System - PREMIUM Zippered Mattress Encasement & Hypoallergenic Protector - Waterproof - Bed Bug - Dust Mite Proof - 60" x 80", Queen - Standard 12"
Your mattress is an expensive investment-why not protect it? 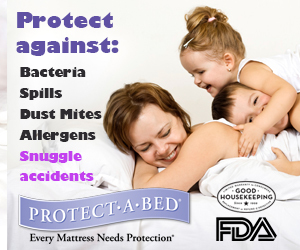 Shield your mattress from spills, bed-wetting, bed bugs, dust mites and allergens. 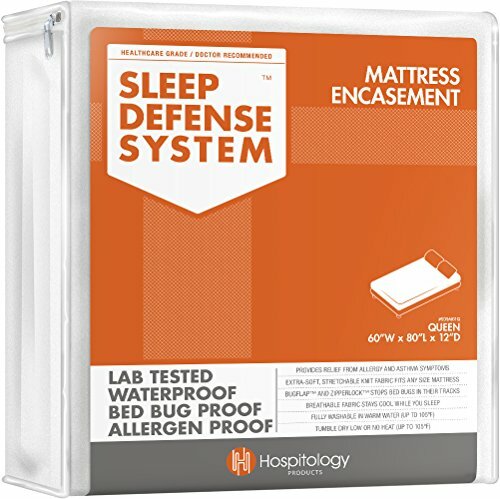 The Sleep Defense System by Hospitology Products brings Hotel and Healthcare caliber bedding protection to your home. Featuring extra-tough seam construction, high thread-count polyester knit fabric and a full 1ml thick polyurethane waterproof layer. Ultra-plush knit fabric is soft to the touch. Fully breathable-does not trap heat and is cool to sleep on. Bed bugs are infesting homes and apartments at an alarming rate and mattress encasements are an effective defense. Help ease asthma and other respiratory symptoms by preventing allergens, dust mites and bacteria from reaching the sleeper. This encasement will accommodate a mattress height of 12"-18". It is fully zippered on 3 sides and features Allergy Blocker to prevent allergens from exiting through the zipper. Bug Flap and Zipper Lock ensure that your mattress encasement remains bed bug proof for the life of your mattress. Please note: This Protector is meant to handle only small amounts of liquid that are addressed immediately. Larger amounts of liquid, and liquid that is allowed to sit for more than a few hours may eventually seep through Protector in the form of liquid vapor. Liquids with Strong Odors may transfer odor to your mattress. Size: Queen (60"x80"). Fits Mattresses 12”-18” Deep. Spot Clean or Machine wash, Tumble Dry Low or No Heat. Please follow all included care instructions to maintain your mattress encasement’s warranty. Contains no Vinyl, PVC, or Phthalates, or Fire Retardant Coatings of any kind. Includes a 5-year limited manufacturer’s warranty. 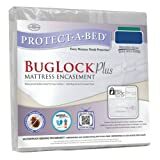 Protect-A-Bed Bug Lock Plus mattress encasements with Secure Seal provide for an economical solution for bed bug protection. Once the encasements are fully zippered shut, bed bugs can not get in, nor get out if they are nesting already. Additionally, existing bed bugs can not feed from inside as the Miracle Membrane prevents them from poking through the encasements and over time, they will die of starvation. Protect-a-Bed encasements are scientifically tested for complete bed bug protection providing peace of mind for you and your guests. 1 year factory warranty for leaks and tears. 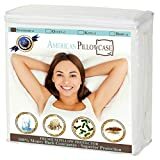 #1 Seller on Amazon Premium Waterproof Bed Bug Proof Mattress Encasement - Lifetime Warranty Protect your mattress from spills, bed-wetting, bed bugs, dust mites and allergens. Hypoallergenic Soft Cotton Fell Terry Surface - Breathable, Cool and Noiseless Our customers are our TOP Priority; therefore we only use the best fabrics in our products. The 360 degree encasement provides the utmost protection against any liquids, bodily fluids, bedbugs, dust mites and any allergen. Helps ease asthma and other respiratory symptoms. The top layer is a High Thread Count soft Poly Cotton knit fabric that will ensure a Cool and comfortable noiseless night's sleep Lab Tested and Certified Our encasement are specifically designed and lab tested for complete bed bugs and allergy protection ZIPPER LOCK Technology The Velcro Flap locks the zipper to ensure that your mattress encasement remains bed bug proof for the life of your mattress. Machine Washable Machine washable with normal household detergents Do Not Bleach!, Tumble dry on low heat. Do not iron. 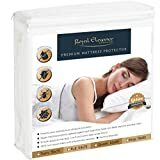 Lifetime Warranty Royal Elegance Mattress Protectors are backed by a full LIFETIME 100% MONEY BACK Warranty No questions asked! Contains no Vinyl, PVC, or Phthalates, or Fire Retardant Coatings of any kind.